Watch San Francisco move from evening to night on a twilight tour by double-decker coach. From Union Square, travel up and down the hilly city, admiring neighborhoods like Chinatown and the Marina as they light up for the night. Stop by the Golden Gate Bridge vista point for a beautiful photo op, and then travel across the Bay Bridge to Treasure Island for a look at the city skyline and to watch the Bay Bridge light show. Head to Union Square to begin your evening tour of San Francisco by open-top or glass-top double-decker coach. Once everyone has boarded the coach and settled in, your professional driver will take off, navigating the city while your expert guide provides fun and informative commentary. As twilight turns to darkness during your 2-hour tour, admire the city from the tops of its many hills and at vista points like the Golden Gate Bridge. 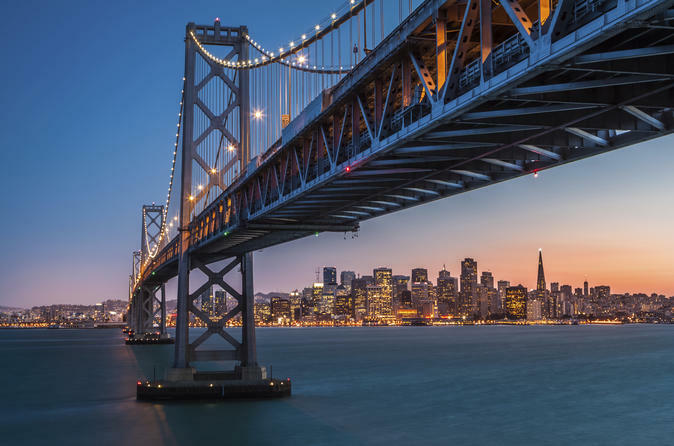 Drive past the Chinatown gates, watch shops light up for the night and cross the Bay Bridge to Treasure Island, where you’ll have a beautiful vantage point of the city skyline and San Francisco Bay. From Treasure Island you can also see one of the city’s newest after-dark spectacles, the Bay Lights! Installed to celebrate the Bay Bridge’s 75th anniversary, the 25,000 LED lights put on a dazzling show across all 1.8 miles (2.9 km) of the bridge each night. After the light show, your tour ends back at Fisherman's Wharf. All coaches provide Wi-Fi, so you can instantly share photos of the city on your favorite social media site.